The biggest news to rock the fashion world this week is the very dramatic potential change in name of one of fashion’s biggest houses – Yves Saint Laurent, popularly known as YSL. The new creative director Hedi Slimane has announced that the iconic name will be no more come the Spring 2013 show in September this year. Yves Saint Laurent will then be known as Saint Laurent Paris. But history aside, this change of name is really something quite big although I’m not quite sure that SLP has the same ring to it as YSL, does it? What say you? That said, I also read that the YSL logo will be kept on despite the change in the brand name. It could lead to confusion in later years when the new breed forgets the origins of the brand and wonder why “Saint Laurent Paris” uses a “YSL” logo. Who knows. They might even then decide to drop the Y in the logo. SLP? SL? Its hard to say if the cosmetics line will be affected by this name change, because YSL cosmetics is now owned by the L’Oreal group and they may have their own plans for it. 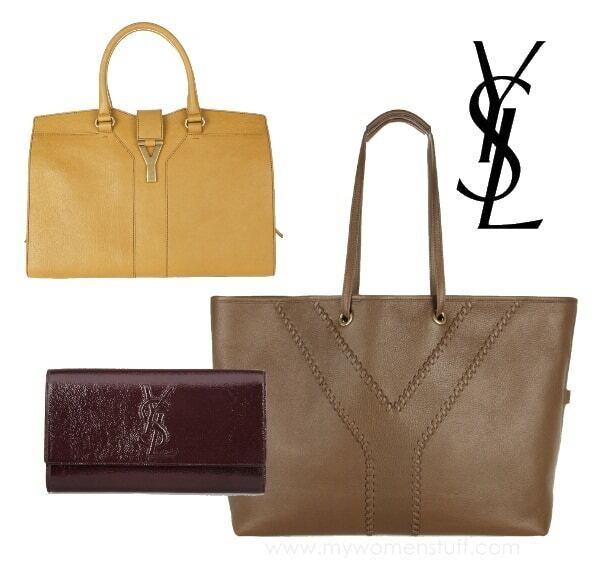 What I am very curious about, is whether the iconic Y in Yves Saint Laurent designed bags will remain. I also love the Cabas Chyc. About the name changed, I think it’s funny that they decide to drop the Y when the bags have a big Y on it. I think you should quickly grab the Cabas Chyc before they turn the Y into P. Oh, that’s such a nightmare. That’s my fear. That they drop Yves then drop the Y! So a Cabas Chyc will be vintage in time to come right? 😉 I can’t imagine a P though, can you? Lol!! And that this with leaving Y tho it won’t link anymore to brand name? Greed…. I know exactly what you mean. Yves St. Laurent without the Yves is like chopping off part of a brand heritage. It just doesn’t make sense about the logo either! I agree with you on the “Y” logo in their famous bags. Honestly Saint Lauren is not a bad name however i think “Yves Lauren” might be a better choice rather than “Saint Lauren”. Saint Lauren reminds me of Polo Ralph Lauren :p.
A bit heartbroken that they decided to change the name. I grew up with Yves St. Laurent, so it’ll always have a special place in my heart. My reaction exactly, Jess. I was horrified they’d tinker with the name. I’d understand if it ws a secondary line but I think this is probably the biggest brand to change its name so far. I wonder if it’s a marketing ploy to get us talking…I hope they retain their heritage. I read they wanted to rebrand, and in the past, there was a St. Laurent Rive Gauche line so they drew inspiration from it, to be more modern. who knows really eh? Could be all just marketing as Sam pointed out 🙂 YSL cosmetics aren’t available here and singapore but there is a small selection at KLIA. YSL is such a pretty logo on their bags. I am also thinking of getting a YSL 20 years down the road. But now, am I supposed to get an SLP instead??? Really strange feeling. Even their lipsticks has that YSL. Are they going change all those? wow, really?!? This is nearly as bad as the whole GAP logo debacle–and I think the worst is yet to come. SLP? Really??? No, it doesn’t have a ring to it at all. And 80% of why people buy YSL in the first place is the logo/brand. If it’s unrecognizable, most people will be over it FAST. I don’t personally wear YSL but I do love their beauty line and I just think theres a certain elegant nostalgia to having the YSL on the compact. I don’t know where these stupid ideas come from. If it aint broke, don’t fix it! Ow that you mention it, yes! That GAP logo was a right disaster! So I guess that’s why the people at YSL say that the logo will stay, but the name will change. I’m not sure how that works right? I mean, people buy it for the name and the logo is but the initials of the name. You can’t say oh we’ll keep the logo but change the name. Is just not done 🙁 I like some of the YSL cosmetics too. I hope they don’t mess with it cos I don’t fancy using something with SLP plastered on it lol! Where’s the glamorous pants of the 80’s. The color blocking and pastel that I remembered from mom’s magazine. It’s always always YSL. YSL is waaaaaaaay catchier than SLP :/ SLP sounds… weird somehow. oh no!!! YSL sounds so elegant and SLP is just soo debased form 😀 that was a shocking news!!! I still prefer YSL! SLP sounds weird! What?! 🙁 That ‘Y’ is truly iconic – instant name & logo recognition! Why, why, Y do new people so often feel the need to bring in new broom sweep out the old? That pix showing the change from YSL to SLP is so not elegant. This brand may start to SLP past my radar in future. I just hate it that they’re changing YSL to SLP. SLP is like sleep hello!?!? Argh. 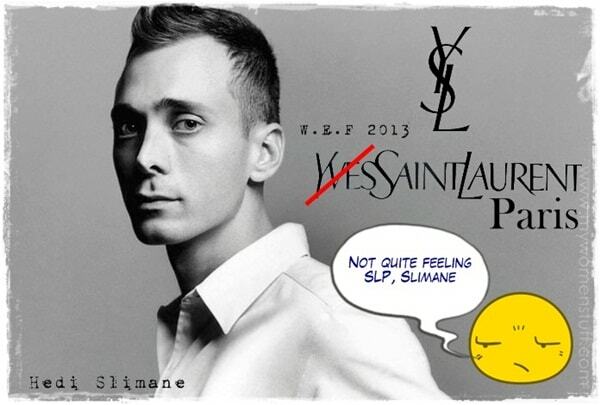 What in the world is Slimane thinking!! !